Kelly commenced his service as the county’s 21st chief prosecutor on Jan. 7, 1889 and exited when his successor was sworn in on Jan. 5, 1891. The “wild west” era is generally considered to have stretched from the end of the Civil War, in 1865, to 1890 when the census showed a string of settled territory from the east coast to the west coast. The “Gay ’90s”—a term coined in 1926—describes an upbeat period of frivolity, business expansion, inventions, and massive immigration. Los Angeles County obviously was not transformed all at once within the confines of those two years that Kelly was in office from a collection of frontier towns with dirt roads, bawdy houses and lynch posts into a cosmopolitan urban area. Actually, by the end of the “wild west” period, L.A. County had become fairly tame. Streets were being paved, sewers were being installed. There were electric cable cars…but still there were stage coaches, and the horse remained the primary means of transportation, the automobile being but a curiosity the longevity of which was in doubt. The telephone and electric lights were here…in some quarters of the county. In that two-year period, locally, Gibson, Dunn & Crutcher was formed, the first “Tournament of Roses Parade” took place in Pasadena and an electric generator was installed in that city, Orange County was founded (carved out of the southeast part of Los Angeles County), the Veterans’ Cemetery at Wilshire and Sepulveda was dedicated, Fort Street, south of First Street in downtown Los Angeles, was renamed “Broadway,” and Volney Howard, a former district attorney and one of the first two judges of the Los Angeles Superior Court, died. Taking a broader view, the Eiffel Tower was opened, the Wall Street Journal debuted, the Sherman Antitrust Act was enacted, the Brooklyn Dodgers became a National League team (losing its first game to the Boston Beaneaters) and, in art, the Impressionist Period began. This was the time—a busy, spirited, buoyant, transitional time—when Frank P. Kelly was district attorney. The pioneering and adventurous days when William C. Ferrell served as the first district attorney for this county (as well as San Diego County), in 1850-51, the days of primitive justice where roving judges decided on horseback disputes over such matters as who owned herds, were far in the past. The prospect of women serving as judges at the lowest and even highest levels of the state judiciary, and Chinese not only qualifying for citizenship but for California Supreme Court membership, could have been foreseen then by only the most prescient. The days lying ahead of online legal research and decisions posted on the Internet surely were beyond imagination. Kelly, though he didn’t know it, stood on a bridge between eras in our county’s history. As you’re apt to discern from his name, Kelly was an Irish American. His parents had immigrated to America in 1836 from the county of Tyrone, in the north of Ireland. A look at a biographical sketch of Kelly appearing in the Oct. 30, 1888 edition of the Los Angeles Evening Express, a few days before the election for district attorney, shows that he had scant formal schooling, and was self-taught. Before entering law, he was a printer and newspaperman. He flitted from job to job, place to place, but was constant during his adult years in his devotion to the Republican Party. Kelly was born Jan. 7, 1853, in Philadelphia. When he was 10, he had to leave school to help support his family, his father and oldest brother being off fighting in the Civil War. His first job was as an errand boy in a drug store, and at 13, he landed a job in a print shop. Kelly’s father and brother returned home at the end of the war, but the father died the following year. Kelly went to California to live with an older sister and her husband, arriving in San Francisco by ship in March, 1867. He worked for about five years in a print shop in Sacramento. The Express says that Kelly worked for about two years for Jeffries’ Law Printing Office in Sacramento, where briefs, transcripts, and reports of California Supreme Court decisions were printed. He thus got his first exposure to law. Having educated himself since he left school by reading, it might be assumed that he not only printed legal materials, but examined the contents. He was 20 when he opened a print shop and began publishing his own newspaper, The State Capital Globe. He sold his operations later that year—1874—and moved to San Francisco where he made a bundle through some good investments, then lost his savings through some bad ones. Kelly went to work in the winter of 1877 for the Sacramento Bee, remaining there just a few months. In April, 1878, he purchased the Tehama Tocsin, and became its publisher. The year of 1884 was a hectic and varied one for Kelly. In January, he was put in charge of a newspaper in Los Angeles known as the “Republican.” That was a brief job, as was his next one. He ran the Evening Express, until it came under new ownership in August of that year. And before the year was over, Kelly was admitted to the practice of law in the state, and went into practice. That marked the end of his endeavors as a printer and a journalist. He was, by the way, neither the first nor the last DA tied to those fields. One of Kelly’s predecessors, Volney Howard, was editor of the Mississippian in Vicksburg, Miss., during the 1840s and of the Dispatch in San Francisco in the early 1870s. 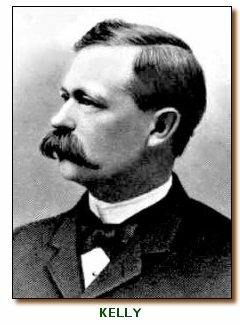 A successor, James C. Rives, who was elected as district attorney in 1898, had owned and edited the Downey Weekly Review while studying law. In 1885, a Republican, J.W. McKinley, became Los Angeles city attorney, and made Kelly his assistant. McKinley left office after two years (going on to become a Los Angeles Superior Court judge in 1889 and Los Angeles Bar Assn. president in 1918). Kelly was hired immediately as clerk of a state Assembly committee headed by George W. Knox, a Republican. Kelly went to work as a clerk for one of the new judges, Harvey K.S. O’Melveny (a former president of the Los Angeles City Council and father of Henry O’Melveny, founder of O’Melveny & Myers). That job also lasted only a few months, and Kelly went back into practice, running as the Republican nominee for district attorney in 1888. Kelly won by 2,630 votes, defeating incumbent J.R. Dupuy. He was sworn in on Jan. 7, 1889, his 35th birthday. During his time in office, Kelly personally acted for the People in seven cases before the California Supreme Court and, as a private lawyer, represented the Board of Supervisors before that tribunal in an elections case. These were the times before there were courts of appeal, and in four of those cases, the hearing was before a panel of three Supreme Court justices. The bracketed phrase is in the original. There were four nominees, and 173 votes were cast. Kelly received only 10 of those votes. It would seem that there was in San Francisco at that time something approaching the “private prosecutions” that have existed for centuries in England. So, long before there were “private judges” in California, there were “private prosecutors,” like Kelly.